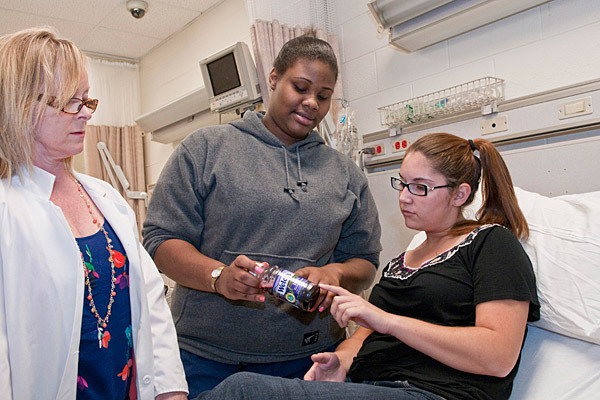 Nursing student Dominique Wisher points out nutrition information on a bottle of grape juice to "patient" Mallory Acevedo as nursing instructor Penny Lewis looks on. Nursing student Rachel Doolittle works with "patient" Jessica Vega. Pictured are (from left) Megan Wilson, Emily Bange, Rachel Doolittle, instructor Penny Lewis and Jessica Vega. Pictured are (from left) Brittany Morris, Katie Rehm and Mallory Acevedo. 10:12 a.m., April 11, 2012--Misconstrued lyrics in popular songs can be funny, but miscommunication in a doctor’s office or hospital ER is no joke. Often the result of cultural, religious, and socioeconomic differences, mixed messages can result in incorrect diagnoses and failure to comply with prescribed treatments. To improve cultural diversity in educating future nurses, a new set of scenarios has been introduced to the University of Delaware’s Healthcare Theatre program through a collaboration with medical anthropologist Melissa Melby. “In teaching cultural competence, we have to be careful to avoid stereotyping and view the issues in a more dynamic way,” says Melby, who joined UD’s Department of Anthropology as an assistant professor in 2011. Under Melby’s advisement, students in UD’s Honors Program developed four cultural scenarios based on the common premise that the patient is at an urgent care center for a non-emergency visit. Karen Avino, co-instructor of NURS235 with Wayne Voelmeck, points out that teaching cultural competence to students when there is no previous frame of reference can be difficult. “Using authentic real-world experiences through simulations makes the didactic material come alive,” she says. 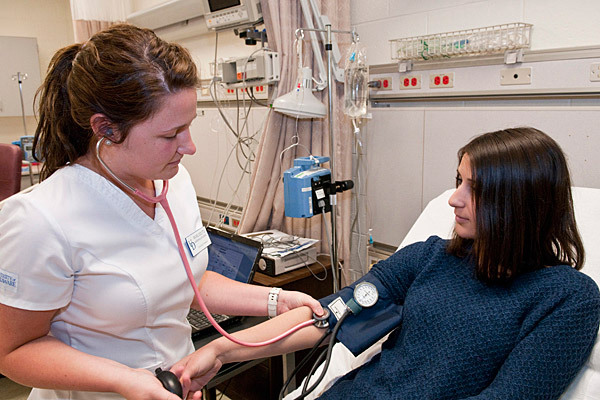 The scenarios, which are not scripts but rather loose frameworks for practitioner-patient interactions, provide the nursing students with a stage for practicing communication skills using the concepts underlying the LEARN model. 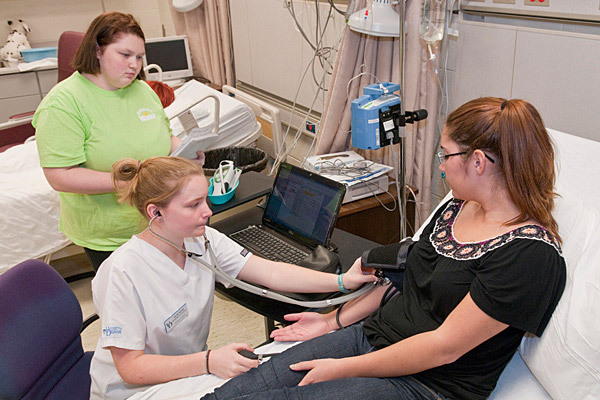 At the same time the approach gives Melby’s anthropology students the opportunity to observe and assess the nursing students’ interaction with their patients. One scenario highlights miscommunication stemming from the nurse’s use of the term hypertension and the patient’s reference to high pertension. The former is the biomedical term for high blood pressure, while the latter refers to an incurable African American folk medicine condition in which symptoms are brought on by strong emotions. In another, a Hispanic patient with poor English language skills is diagnosed with diabetes. In addition to dealing with the language barrier, the nurse has to try to convince the patient that it’s not all right to take her mother’s medication for this disorder. Amy Cowperthwait, Healthcare Theatre program coordinator, points out that in this scenario, the issue is as much socioeconomic as it is cultural because the patient can’t afford to pay for her own prescription. In the debriefing following the scenario, she praises nursing student Dominique Wisher for helping the patient explore ways to get the correct medication more affordably. Cowperthwait also gives credit to Mallory Acevedo, who has played the part of the Hispanic patient, for grabbing a bottle of grape juice as a last-minute prop, thereby setting the stage for Wisher to initiate a conversation with her patient about the need to monitor her sugar consumption. Neil Redfield, who helped to create the Hispanic scenario, admits that culture isn’t something people usually think of in the context of contemporary health care. The project not only raised his awareness of this issue but also gave him the satisfaction of contributing to the education of future practitioners. Cowperthwait, who pioneered the Healthcare Theatre program several years ago with theatre professor Allan Carlsen, admits that at first she was a bit skeptical of the undergraduate anthropology students’ ability to give meaningful feedback to the future nurses. However, she is glad to have been proven wrong. Elizabeth Wilford – African-American patient scenario. The nursing students received feedback from students in Melby’s anthropology class as well as from Amy Cowperthwait, Healthcare Theatre program coordinator, and nursing instructor Penny Lewis. Healthcare Theatre, a unique partnership between the College of Health Sciences and the Department of Theatre at the University of Delaware, helps healthcare professionals develop psychosocial skills through interactive scenarios presented by theatre students. With this transformative approach to education, theatre students are trained to portray patients and family members so that health sciences students can practice both technical and interpersonal skills in a safe environment without compromising quality of care.